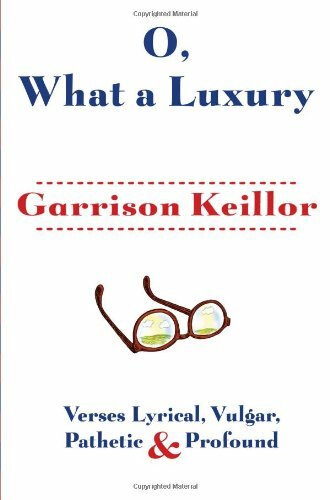 In the absence of an extensive record for the writing of poetry, Garrison Keillor, the good-natured and folksy humorist who is the host of A Prairie Home Companion and a respected anthologist of contemporary poetry, has now produced an impressive first collection of his own poems containing a wide variety of light verse. This volume includes poems ranging from the overtly jocular and graphic to those with more serious undertones. Some pieces are descriptive and place-oriented; some are heartfelt and moving. And some of these poems deal, albeit a bit too lightheartedly at times, with the most sensitive of human relationships, giving a nod occasionally to the sublime. In other words, Mr. Keillor’s inaugural collection lives up to its title: O, What a Luxury: Verses Lyrical, Vulgar, Pathetic and Profound. As you might expect, he often writes with undercurrents of thoughtfulness provided as humor and entertainment, so much so that there are poems in the volume that invite revisiting and, certainly, retelling. There can be no doubt that, by way of his diverse background and penchant to entertain, more volumes of Mr. Keillor’s rich Midwestern sensibility in verse will be forthcoming. Perhaps he might choose in subsequent volumes to go deeper, to allow self-exposure, to wrestle with and explore a more focused range of subjects, to lay claim to a deepened poetic sensibility. Nevertheless, there is much in this volume both to interest and to entertain those open to fresh insights. This volume provides an opportunity to see Mr. Keillor in perhaps his most intimate longing, i.e. to express unequivocally that which resides within, revealed through the lens of humor in scores of his own individual verses in the distinctive landscape of this always entertaining and often thoughtful poetic journey. This collection consists of a number of serious subjects rendered lightly, which results in a kaleidoscopic effect that, while often entertaining, tends to submerge the more serious elements almost as soon as they are introduced. His unique perspectives—ironic yet sensitive—cannot be ignored in any real judgment or evaluation, if you will, of this new poetic venturing. While this volume remains true to Mr. Keillor’s stylings in his other writings and offerings over the years, there is definitely a distinct reaching in these poems. Though not quite a summing up, this collection nonetheless constitutes a more conclusive statement of just how far Mr. Keillor has come on his creative journey. In surveying this wide-ranging collection of poems, it is evident that there is a tentativeness in relying so much on light verse and on themes and approaches that are popular, although he does at times risk a deeper engagement with subjects that are clearly revelatory of his own ideologies and experience, moving in these instances into realms which are definitely the purview of poetry. The reader will not have any difficulty being entertained by these verses, nor in searching out and finding Mr. Keillor’s matter-of-fact Midwestern sensibility, that Prairie Home Companion style and delivery that has become his signature persona over the decades. It is in this volume of Mr. Keillor’s own poetry that he is clearly stepping out, transitioning into a more personally revealing phase of his life, perhaps with a zeal to give his poetry a more central place in it. This collection is truly a tribute to the range of his scope and his skills, to how effectively he can measure the pulse of America. While some of the poems—their subject matter, attention to metrics, etc.—might be more rigorously attended to. This is after all Mr. Keillor’s first full-fledged volume of verse, a revelation of his realized self that can be shared by all. After decades of a unique intimacy with the American public, we glimpse the real Mr. Keillor in this volume, his Midwestern insight and clever word play woven, often skillfully, into many individual poems. As the fashioner of excitement, Mr. Keillor gives us this entertaining collection of poetic high jinx. But where indeed is the “real” Mr. Keillor? We can be sure, by way of experience, that he is keeping a good deal of revelatory material close to the vest to be meted out bit by bit in future volumes of poetry.